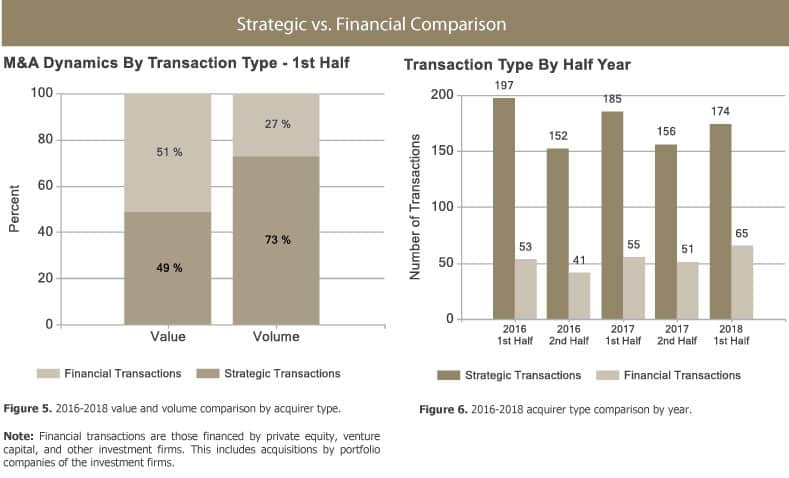 1st Half 2018 Finance M&A Trends Report - Berkery, Noyes & Co., LLC. Online payments giant PayPal completed two of the industry’s top ten highest value transactions year-to-date. Along these lines PayPal announced its acquisition of iZettle, a mobile payments company that offers small businesses with portable point-of-sale solutions, for $2.43 billion; and Hyperwallet, a digital payout provider aimed at the sharing and gig economies, for $400 million. 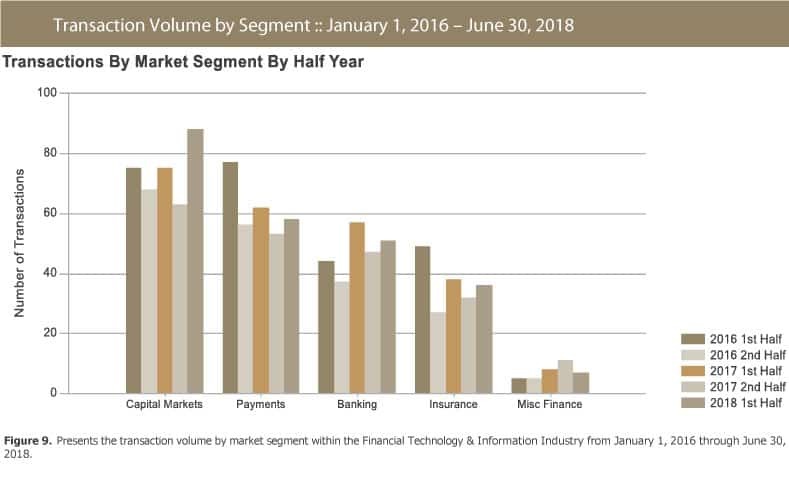 Total transaction volume in 1st Half 2018 increased by 15 percent over 2nd Half 2017, from 207 to 239. Total transaction value in 1st Half 2018 rose by 34 percent over 2nd Half 2017, from $24.27 billion to $32.53 billion. The median revenue multiple, after rising from 2.6x in 1st Half 2017 to 4.5x in 2nd Half 2017, declined to 1.8x in 1st Half 2018. During the last 30 months the median revenue multiple was 2.3x. The segment with the largest rise in volume in 1st Half 2018 over 2nd Half 2017 was Capital Markets with a 40 percent gain, from 63 to 88 transactions. 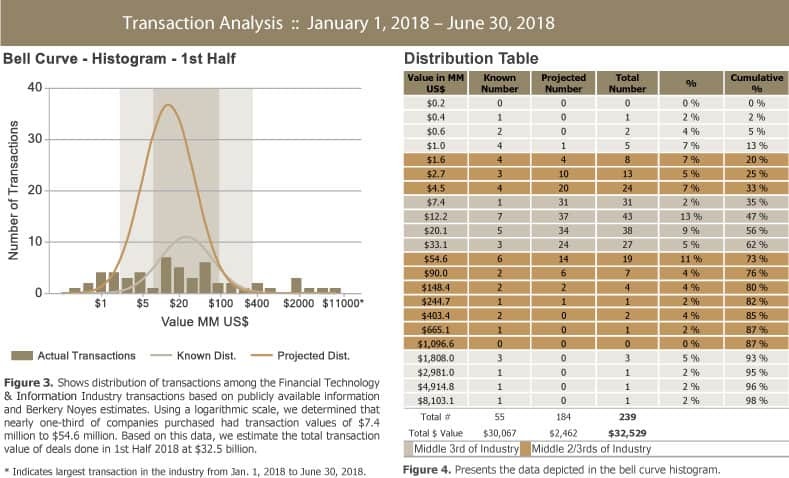 Berkery Noyes tracked 1,129 Financial Technology and Information transactions between 2016 and 1st Half 2018, of which 258 disclosed financial terms, and calculated the aggregate transaction value to be $93.74 billion. 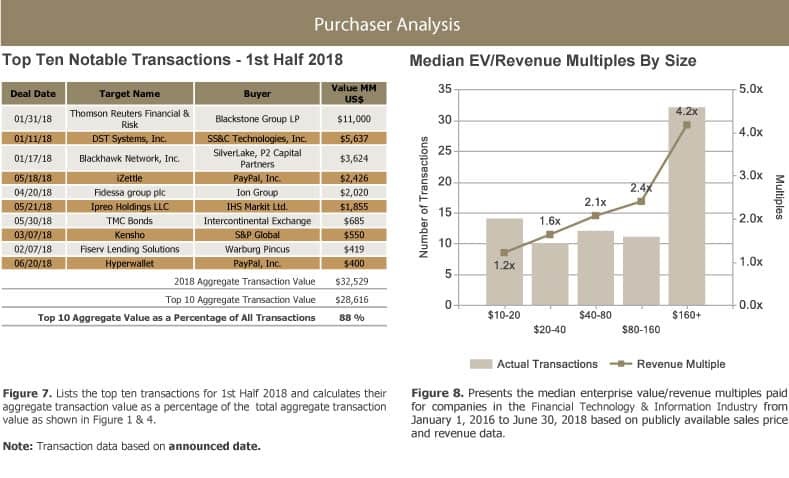 Based on known transaction values, we project values of 871 undisclosed transactions to be $15.98 billion, totaling $109.73 billion worth of transactions tracked over the past two and a half years. 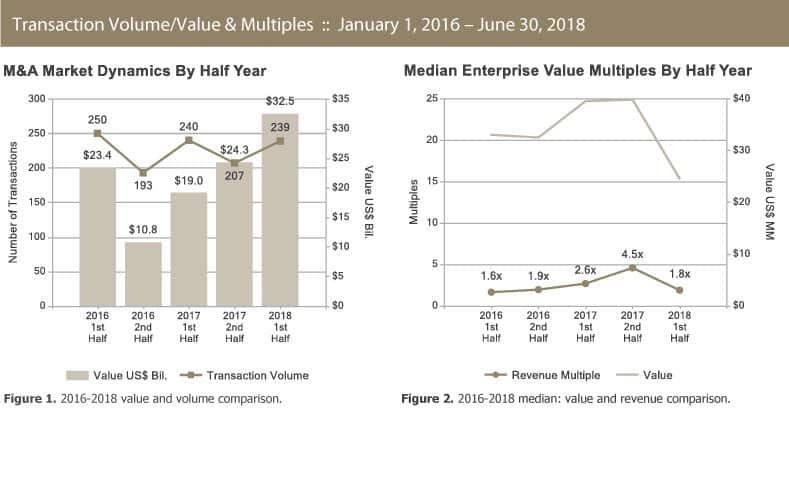 Disclosed median enterprise value multiples for all segments combined in this report during the last 30 months were 2.4x revenue and 13.6x EBITDA.